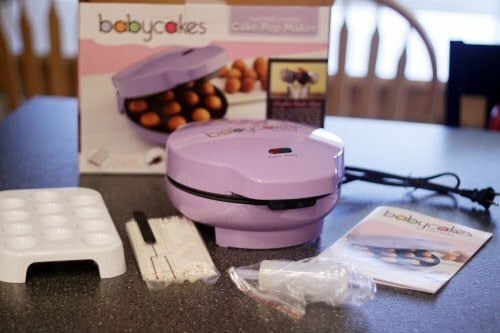 Do you have a Babycakes Cakepop Maker and are looking for info on how to make cake pops with the Babycakes Cake Pop Maker? If so you’ve come to the right place. Pull up a chair and grab a cake pop! The giveaway with this post has closed. Thank you! One of my Mother’s Day gifts this year was the Babycakes Cake Pop Maker. I will admit, my first thought was “I bet this won’t work”. Cake pops require baking and destroying a cake, mushing it with frosting, and forming all of the pops by hand. It just won’t work if you don’t do it the way Bakeralla does it. I thought the cake pops would be dry, they will fall off the stick and probably won’t even taste good. It will be yet another kitchen gadget that will collect dust. While I had my doubts, I also have to admit that I don’t LOVE the traditional cake pops (please don’t judge me!). I don’t know why – it’s frosting and cake – what’s not to love – but the flavor has just never been that great to me. I do love making Oreo truffle pops, but the true cake pop I’m only luke warm on at best. So part of me wondered if this little machine could create cake pops I’d like more. Maybe??? I am very happy to report that I was extremely impressed with the Babycakes Cake Pop Maker. This sweet little machine won me over in less time than it would have taken me to bake a cake (much less the time spent letting it cool, mixing it with frosting and forming into pops). Let me share my batch of cake pops using the Babycakes Cake Pop Maker. My cake pop maker came with the machine, sticks, a fork, a syringe for fillings and a cake pop stand. I decided to use their vanilla cake pop recipe. It was a bit thicker than cake batter from a mix, it was incredibly tasty straight from the bowl and it was delicious when baked. It had a texture that reminded me of pound cake. Between my husband, daughter and myself, quite a few pops never saw a coating of chocolate. Those little cake balls are great on their on. After mixing up my batter, I decided to follow their tip of putting the batter into a bag, and piping it into the machine I’m sure you can use a pastry bag, but a large Ziploc did the job nicely. 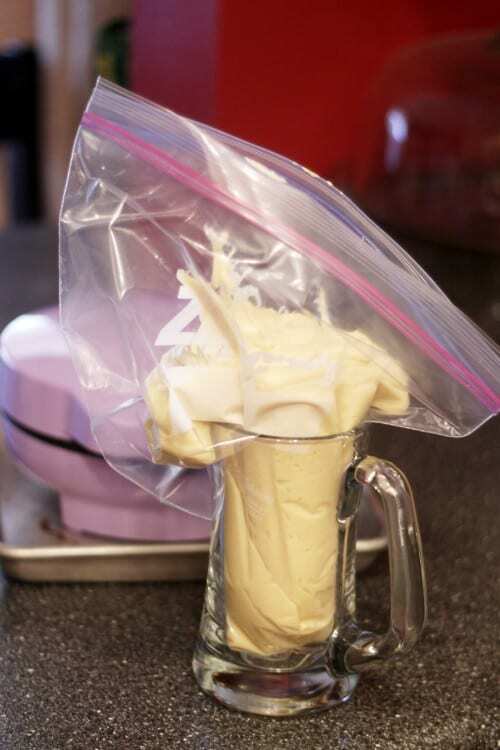 Whenever I need to fill a bag like this, I use a heavy mug to hold the bag for me while I scoop in the frosting or batter. After filling the bag, I snipped the end off and was ready to start cooking. Piping the batter in was easy, I think spooning it in would be harder and probably a bit messier. My first batch I didn’t use quite enough batter, so they were not perfectly shaped, but they were certainly close enough. The other thing I learned with my first batch was that I jumped the gun on thinking they were done, and cutting one open revealed that they were not. The 4-5 minutes recommended baking time was pretty accurate. They cooled quite quickly. I am going to order some additional cake pop stands, but for the time being I used an empty egg carton to hold my cake pops after they cooled off. My daughter suggested we fill them with buttercream frosting. I figured it was worth trying. I whipped up a small amount of buttercream, filled the syringe, and we injected buttercream into about half of our cake pops. After making all of my cake pops, I stuck them in the freezer for a few minutes while I melted my chocolate to dip them in. I used Wiltons Melts (which will set up better than using chocolate chips). I dipped each stick into the chocolate and then into a cake pop. I was a bit worried how the cake pops would do on the sticks, since they aren’t as moist as the frosting style cake pops. I am happy to report I actually found them easier to handle on the sticks. I didn’t have one fall off a stick, which I usually have a few of when I make cake pops. For me, I found these far easier to dip than traditional cake pops. They never felt wobbly on the stick, not one came loose from the stick, and they are so perfectly round – something I never achieved with other cake pops. How do they taste? Personally, I LOVE them. No, they are not dry – they were moist and delicious. No, they do not have the same consistency of the cake+frosting cake pops, but these suit my taste a bit better. It tastes like cake – and to me that’s a very good thing. This delicious vanilla cake pop recipe is perfect for your Babycakes Cake Pop Maker! Bake 4 to 5 minutes or until a toothpick inserted into a cake pop comes out clean. Allow to cool and glaze or coat, as desired. 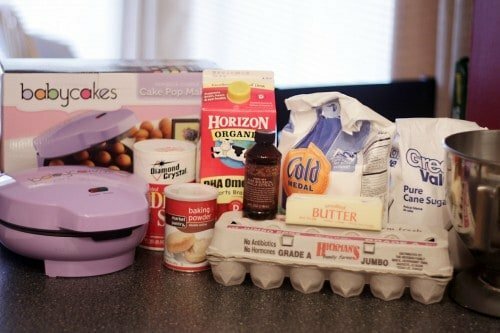 recipe for the Babycakes Cake Pop Maker! I think there is plenty of room for all of the different kinds of cake pops, but I think these will be the ones I make most often. They were so much quicker and easier, and I enjoyed the process more because of it. 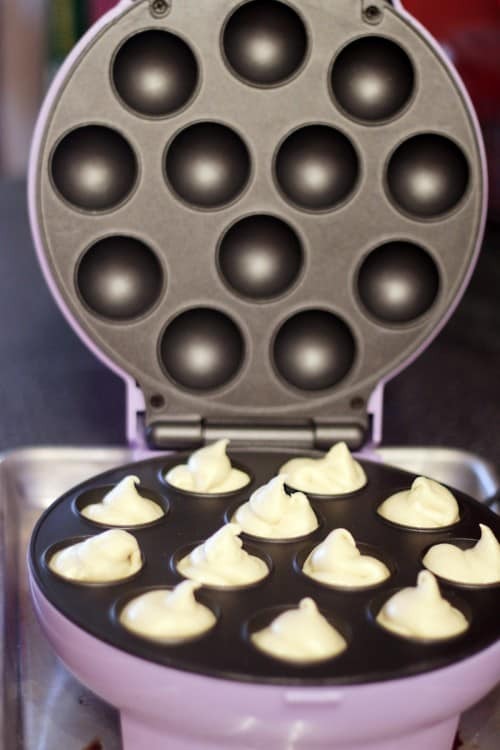 I am also excited to see what else I can make with this little machine – and will be sharing one of my favorite desserts with you later this week – it involves donut holes, and this will be perfect for creating them. 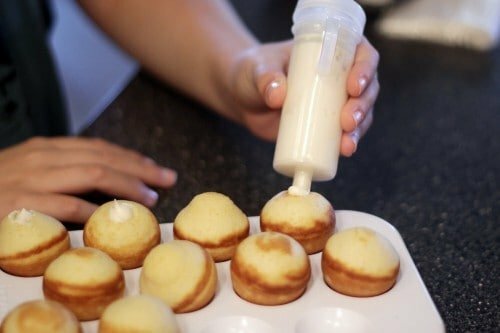 Tami over at Unique Party Food To Go made Pizza Poppers with her Babycakes Cake Pop Maker. Love it and think they would be a hit with the kids. Check out my other cake pop posts by clicking here! Thank you for the honest review. I have seen this machine online and had the same thought, that it wouldn’t work, but I’m glad to hear it works well! I will definitely be entering the giveaway, I need one of these. I have tried the other kind of cake pops and didn’t like them at all, this is definitely a better idea. I definitely want a Cake Pop maker now! The Cake pops are gorgeous! That little machine is adorable. Pretty darned cute in purple. I bet those buttercream filled ones were yummy. I’m intrigued by this contraption! I too am only lukewarm on traditional cake pops, so if you like these better I think I might too! Great post! I have not seen this machine. I agree with you about being lukewarm on the traditional cake pops. I’ve made dozens of cake balls and just never cared for them. I think it’s a texture thing. Everybody loved them so I continued to make them. But, I think I would much prefer these since they’re just cake. Looks great! OMG, it is the funniest thing in the world that someone has now come out with a cake-pop maker. Smart, too! I like the idea that it’s just cake, not the sticky, thick cake-icing combo that goes into traditional cake pops. Either way, it’s tons of fun! Oh my after I have made 100,000,000,000, balls by hand this would be awesome! I have GOT to have one of these little cake pop makers!!!!!! This is such a cute little machine and your cake pops came out great! I’m also not a huge fan of traditional cake pops, too much frosting. These would be perfect for me! I loved reading your review. When I saw this at Kohl’s I was like, “yeah, right, like that’s going to work!” However, I do like Bakerella’s cake pops, but I’d be willing to try this too. Your cake pops are gorgeous! I would love to try making these with chocolate cake mix and maybe some mini-peppermint sticks, instead of the traditional paper sticks. Maybe some candy canes would be cool for Christmas time, with some white chocolate coating and some red and green sprinkles. It would be an excellent Christmas party favor! For some color, one could try some red velvet cake mix, with white chocolate coating that’s dyed purple? That would look pretty! It would be a great party favor for a little girl’s birthday party! To be honest, I have never been a huge fan of making cake pops because they are just so tedious and the whole texture of the frosting+cake inside kind of skeeves me out. But I love the idea of these so much! because of you and this fantastic post I have just ordered a cake pop maker from Babycakes! I have seen that at Kohl’s, but wasn’t’ sure how it would really work so thanks for the detailed pictures and great review. LOVE this! I want one because I don’t like the current popular version of a cake pop where you crumple the cake and mix it with frosting/cream cheese. It’s is much much better because it’s all cake! YEAH! I can think of so many fun things to make in this machine!!! Those little cakes looks fantastic….. those look like fun for a buffet thing… or potluck… Thank you for post. What a great idea! It definitely stays truer to the taste of cake (I’m not a frosting fan). The shape of the pops also look perfect! Thanks for the post! I love this!! I was reading over the reviews of the HG cake pops she did and I admit, I am not a fan of cake pops because of the same reason as you, they are a bit…. something.. I don’t know what, but I could see myself using this. Thanks for the opportunity and i love your blog, I will be back for sure! 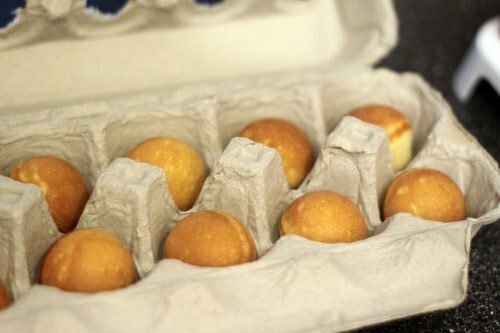 The first time I saw the babycakes machine I though, ‘This would be wonderful for quick donut holes.’ Can’t wait to see what you make next! I NEED one of these. Cake balls are probably my favorite thing to make, but they are so darn tedious. I would love to win one, but if not, I will definitely be buying one in the near future! So glad to see that they work and make the cake balls look so flawless! Love it! Oh my goodness! This looks like so much fun! oh my i need one of these to make my hundreds of cake pops for my Cake Pop Wedding Cake in September! I’ve seen the pop maker but I’ve always been a bit skeptical… I love how perfectly round they turned out! OOOH I can’t wait to hear about the giveaway! My friends and I love cake pops and have attempted them several times with varied results. Your post is pretty awesome because although I love cake pops, I find them too sweet because of the frosting. I’m glad to see that the babycakes cake pop maker works! All I have to say is yum!!!! This would make my life SO much easier than doing them by hand!!! Great photos! I’ve never really considered trying to make cake pops before, but seeing them everywhere for the past few years is starting to intrigue me. This magical device seems like the perfect way to try them out! Thank you for the review. That is my biggest problem with cakepops, the texture. I love both frosting and cake but something about it being mashed together really turns me off. But everyone always wants me to make them including my daughter. I think with this little baby I can make the cute pops and actually enjoy eating them too! Yum. I think I would like those better too, as I love cake, but the mushy cake pops don’t have the right texture for me! I have never been a fan of cake pops, so if these are unlike cake pops I am in! We totally need one of those machines over here! Wow! I have got to try this machine! I love the little cake pops but have not been so successful making them on my own. I think the cake pop maker is just what I need!! Thanks so much for sharing all of these great details and your experience! That cake pop maker looks so cute! And the cake pops look great! Sounds good! I haven’t made cake pops cuz the ingred. don’t seem that appetizing. Maybe I’ll pick up this product! Also, I love how there are ‘traditional’ cake pops already. Cake pops are like a year old! 🙂 Internet time flies! wow I want one of these too! I’m super stoked for this. I actually really hate the taste of regular cake pops. 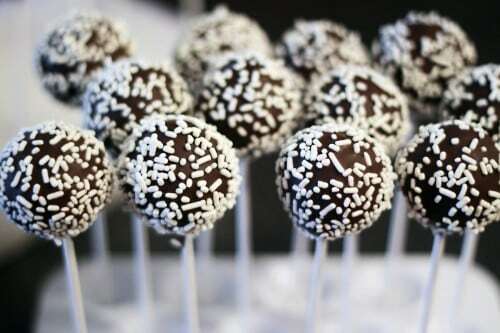 (The Oreo truffle pops are amazing though). Cake pops are just too sweet! This is the most exciting thing I’ve seen in a while. That machine looks like SO much fun!! I had never even heard of one of these until now! They look beautiful! I also was never able to get the perfect round shape either! I’d be eager to try it out! how absolutely adorable. 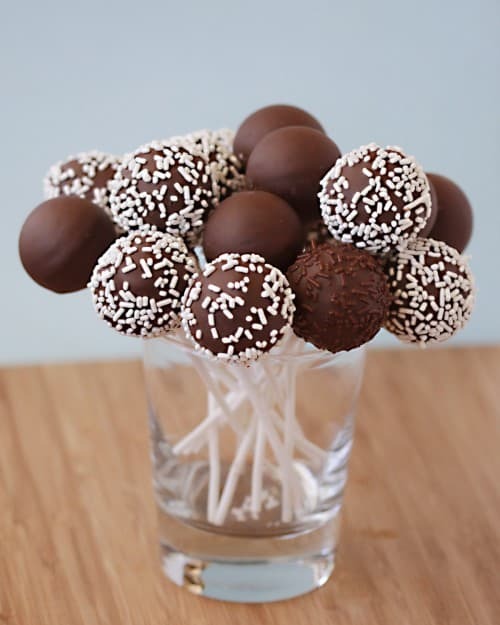 I love the whole idea of cake pops. 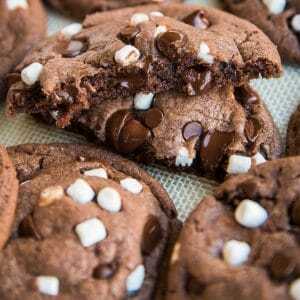 cute and perfect to sedate my sweet tooth! wow what a great machine! I wonder if you can get them in the UK? I don’t like regular cake pops either – far too sweet and sickly but these look FAB!! Too cute! I had no idea something like this existed! I’ve never seen Babycakes before but these cake pops look beautiful and so delicious! 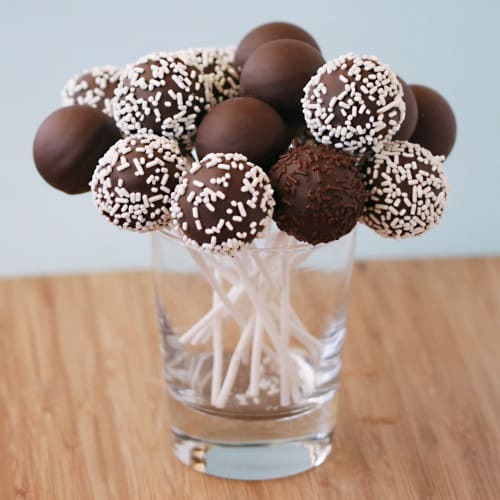 Love the idea of this kind of cake pop! Never did like the sound of the others, but I never have had one either. I love how the cake pops turned out! super cute! I am so very in love with your blog and can’t believe I hadn’t read it before. I’m linking to you and will now spend an embarrassing amount of time reading your older posts. Looooove love love this blog. 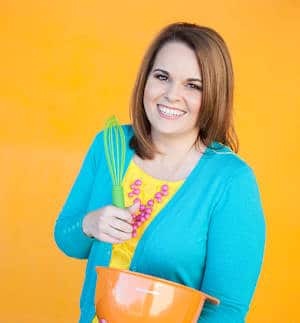 Here is how I found you; I read One Domesticated Diva all the time and today I read her post about push up cake pops and she linked to Chocolate Cake Moments’ post about them, who linked to you! So glad I clicked and clicked because I’m totally making your chocolate covered s’more bars this afternoon as an after school snack for the kids today (and ordering those push pop container RIGHT NOW). I wish this had come out a few years ago when I started making cake pops. It would have made my life incredibly easier, however, I’d love to win one. If I don’t win…I’m definitely buying one. I’ve wanted to try to make cake pops, but they just look too messy. This looks so much easier! Thanks for sharing your review! Wow! I can’t believe it really works, you liked them and well I should not be surprised that yours look AMAZING! My husband would literally kill me if one more kitchen gadget appeared but, I am so intrigued. How to get this amazing cake pop machine? Never wanted to make the traditional cake pops, but now I want to give the machine a try! 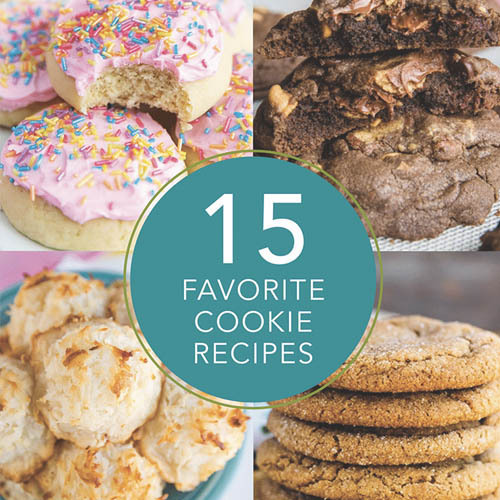 these look like so much fun to eat and make. I’m thinking there will soon be another appliance in my kitchen. Can’t wait to try spinach/parmesean pops, or maybe even sausage cheese pops! Loads of possibilities. Strawberry shortcake pops anyone? this will make baking a lot easier!!! I would love to have this. I’ve tried to make these before, without a maker such as this, and they are difficult (for me, anyway!). So Please count me in to win! Just started following you on Facebook. Excited to try all your yummy ideas! Looks lke a wonderful new gadget! I LOVE making traditional cake pops… Yet, I couldn’t agree with you more, although they look fabulous, they just aren’t the type of dessert that makes my mouth water. I guess the main reason why I like them is because I can manipulate them into whatever shapes I want! 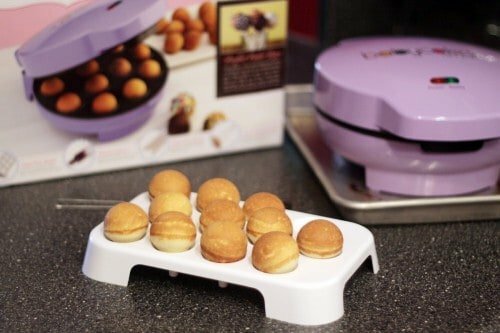 I would love to try this cake pop maker for myself…thanks for posting about it! Did that syringe come with it? How did the filled ones turn out?? I love the idea of using the mug to help you fill the bag! I will be using that one! cute, think you could make takoyaki with it? or no? That looks so neat. Definitely an appliance I don’t have yet! I liked Select Brands on facebook! Looks so fun, and makes those so easy!! I like select brands on facebook! I’m following Love From the Oven on Twitter!!! The Cake Pop maker looks AMAZING! I have liked on FaceBook and I’m going to pass the information on to my friends. They are going to love this. These look amazing! I can’t wait to try this on the weekends. I am so bummed out. I have tried to get this at Kohls now for a month. Now they tell me that it is no longer available……I want one. and is amazing, I have made cake pops with my own recipe of green pigeon peas gourmet cakes, and they are delicious!! !, everybody likes it. I just got my machine! Can’t wait to start making Cake Pops!! If they come out good, I’ll be making a batch for Father’s Day for our BBQ at my MIL’s house tomorrow! This is an awesome gadget! I could do so much sharing if I had one of these babies to crank out more Cake Pops! A very versatile gadget too! 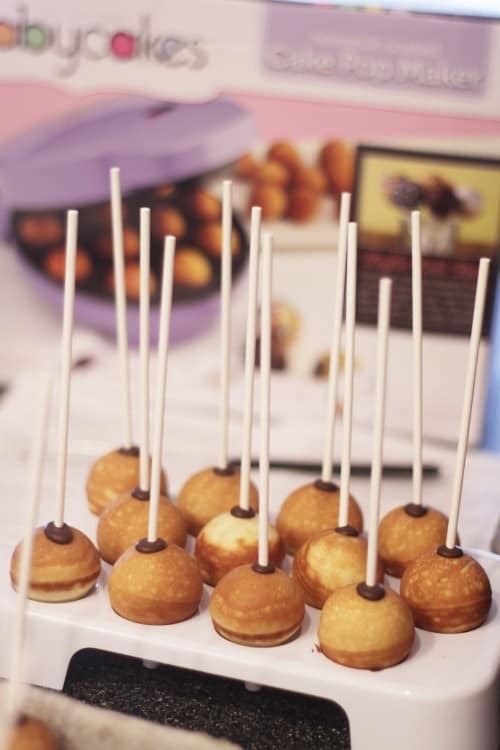 Cake Pops or Donut Holes…hmmm…so many decisions! Norma, I melt my chocolate in the microwave, every time. I use it at 50% power, and usually start with 30 seconds, and follow in 15 second increments. I know the double boiler method rocks, but with the kids around, I need options I can walk away from (and not set the kitchen on fire as a result!). Oh my, I just found out about the Cakepops machine today; I so need one but don’t have the money right now. I found your site through Google as I was looking for reviews. Used this cake pop maker yesterday and loved it. I had a really hard time getting the candy coating on in a nice smooth consistency to decorate. It was better when I chilled the cake pops but still had issues with the thickness/thinness of the coating. Any tips? Did they come out moist? I am thinking of buying one. I just made these this morning. How easy and so much fun. They came out amazing. Thanks for the tip about freezing them after adding the stick with a bit of chocolate on it. It worked well. I used a spoon to twirl the pop in to take off the extra chocolate. I can’t wait for my kids to try them. These will definitely be made at the next birthday party!!! I love this! I have been making cake pops the difficult way. This looks easy! So cool I’m gettin the cake pop maker… it’s purple!!!! This maker really doesn’t work well at all. I do not recommend it as it is nothing like a real cake pop. I just ordered cake pops from Cake Pop Creations http://www.cakepopcreations.com and whatever they do it is amazing and seems to follow what a cake pop really is. In my opinion cake pops should have a almost mushy cake dough texture. The Baby Cake Pop maker makes a bake pop not a cake pop. I am very pleased with your review. I’ve been shopping around and reading so many blogs and most were not as detailed as you! Thanks for helping me make my decision to purchase the babycakes cake pop maker. I think I am going to try these for halloween and print scary face on my photofrost printer to put on them. Thank you! I could never get my head around traditional “cake pops”. When I first heard about cake pops, I actually thought that this was how they were made! With an actually cakey texture in the centre not… regurgitated cake dipped in frosting. Do you think that the cake pop machine really works and tastes better than making all of them by hand? Were you able to make all of them faster? I’m still skeptical about this new gadget but interested to try it out!! Alexa, it absolutely works – I’ve used mine for both cakepops and donut holes and I love it – I truly wouldn’t recommend any product that I don’t love. I personally prefer the cake pops this way, compared to the frosting and cake mixture. I love cake. I love frosting. But for some reason I just don’t love the taste they create in a cake pop. It’s so much quicker and easier and the cake pops look so much nicer – perfectly round and beautiful! I completely agree, and bought one over the weekend. I really didn’t like breaking up a care, and it was too sweet for me, the other way. I was looking for tips on dipping. First time I saw a cake pop maker, I though…How stupid. Just make a cake or cupcakes. But now that I see some of the things that can be done with one of these…I MUST get one. I bought mine from bed bath and beyond! I tried making it today with cakemix, it did not work out. It came out to be spongy. I used duncan Hines classic yellow… It is really hard to get perfect circles… Any suggestion? Any suggestions on dipping them? Yours looks flawless and perfectly smooth!! I had no idea a cakeball ove existed!! That would require some serious cake ball making. Your recipe is also delicious—I’m finally getting the hang of them! I am in SHOCK! my 5 year old asked me to get this for her a few weeks ago. we saw it ON SALE at bed, bath and beyond. But my answer to her was…”no, this won’t work” I’ll try to look at recipes online and we went on our merry way. I found this site tonight and read through all of the cake pop recipes, including the oreo recipe and saw the baby cakes maker mentioned a few times, well I finally clicked on the link and im so surprised this it and frankly, a bit sad I didnt get it when my daughter asked me for it! we are going first thing in the morning to see if they are still available at the store so i can make these for my step brothers bday on saturday. !!! Okay, maybe just maybe I’ll stop going to Starbucks and paying $1.50 each time I want a cake pop. This looks super easy! Glad to see it’s on sale at bed, bath and beyond! I just picked up this machine today. 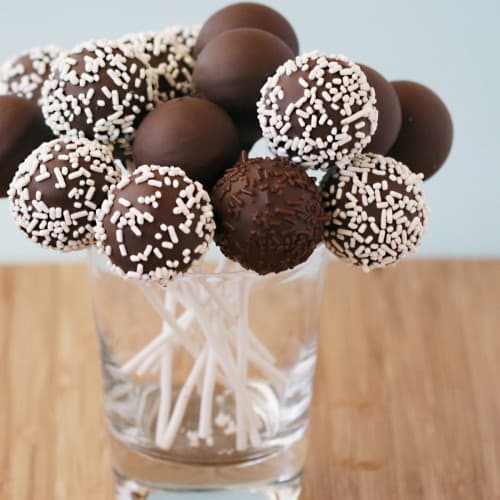 I have been wanting to make cake pops but the idea on what you have to do to make them… wow. In the time it took to put them on the cooling tray the next batch was ready. Now on to tackle the frosting of my 4 dozen. I used a cake mix and per the instructions in the book added 1 extra egg white which made the difference. A 16 oz box yielded 4 dozen. So that’s alot of bang for your buck if you are looking to make and sell these. I love this machine just got it yesterday and me and my daughter spent all night playing with it .Making cake pops for my nieces and nephews for Halloween. I was just wondering if i can get any of the babycake range in the uk ? Have you ever tried making these ahead of time and freezing them? Would love to make these for my sister’s wedding, but want to keep them fresh without making them a couple of days before the wedding. Would you be able to freeze them after rolling them in chocolate and sprinkles? Any tips would be appreciated! Thanks! Thank You for this honest assessment!!! I make a ton of cake pops, usually as a fundraiser, and to hear how easy they can be and still be able to inject them with icing… Yum!! I just bought one, and can’t wait to try it out for halloween. I think they look lovely and thanks for all the wonderful tips. My Christmas gifts will have a little extra this year. 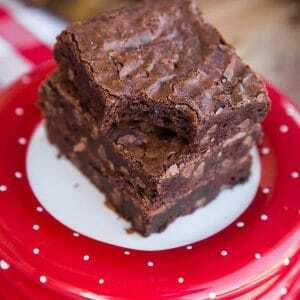 If you chocolate is too thick try a little veg oil or some paramount crystals to thin it out. I used mine yesterday and it was super simple! I used the vanilla recipe and it was ok a bit dry and not a ton of flavor. I’d like to use a box of cake mix but i’m nervous, has anyone done this and have any suggestions, was it easy? more flavor? less dry then the book recipes? I’m making these for my daughters halloween party at school and bought cute indivdual bags to wrap them in, I’m so excited! This article has helped a lot! I got my Babycakes Cake Pop Maker last week and I’m very anxious to try it. The only thing I’m worried about is injecting it and dealing with oozing buttercream. Did that happen you to at all? How did the whole injection process go for you? Great post! I just bought mine today at Kohls (on sale and 30% off!) and fell upon your blog to find delish recipes. Love your blog! Can’t wait to try this with my girl this weekend. Great Post.. i just saw one of these at Kohls and I am going to wait till I get a 30%off to get one! but i was wondering if anyone has used this machine to make brownie balls?? Let me know!!! Thanks for the insight; such wonderful information! Just got this machine myself and looking forward to making them for my son’s b’day in the next couple days. However, I have a question? Due to my son’s peanut allergy, I can’t use candy melts. Everything that I have found was made on the same machines that processed peanuts or processed in the same facility. Any tips on making a thinner frosting to go on the outside that will hold well, and with sprinkles? I don’t have this particular brand machine, but I have a cakepop maker and I love it!! Mostly I use it to make my kids chocolate chip pancake puffs! 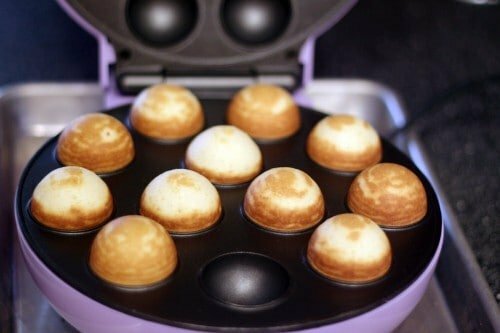 I just use regular pancake mix and throw some mini chocolate chips in with it and pour it into the pop maker and VOILA – perfect pancake puffs! My kids love love love them! I’m so looking for new recipes and ideas! I am thinking of purchasing one today at kohls. Did the recipes come with the cake pop maker. If not where did you get them? I just bought one today for my daughter for x-mas. The boxed cake mixes sold by BabyCakes is $10 a box. does anyone know if you can use a regular grocery store box mix, like Betty Crocker or Duncan Hines?? I used Pillsbury cake mix and it worked great 🙂 Had issues with the red velvet one, but the white and strawberry worked great! 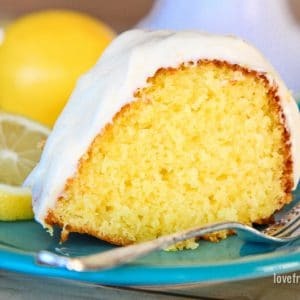 Has anyone used a homemade cake recipe? or a homemade gluten free cake recipe & used this? Just bought my babycakes cakepop maker because i always read about it on your blog! Do you need to put anything on the machine to keep the cake pops from sticking? I know it is non-stick but mine feels a little grainy–wondering what you do. I really appreciate all the tips and the scoop about the cake mix. I’m on my way to buy a few for the family christmas presents. I am hoping, maybe someone will get me one for my birthday this month. 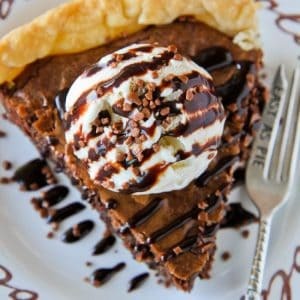 Has anyone tried the other machines like the pie maker? The Pillsbury sugar free cake mix works perfectly! Does anyone know if Brownie mix works?? One of the comments above asked about frosting without candy melts. I didn’t want to melt more chocolate last night for the second half of my pops and made my own little powdered sugar, shortening, water mix with some cocoa powder. That should work for kids with allergies too. Last night I made chocolate cake pops from the recipe in the book (substituting hot cocoa for the coffee), donut holes in the afternoon, and pizza balls for dinner. I LOVE this! My mom doesn’t like cake balls because they call them truffles and she makes REAL truffles that are WAY better. She also doesn’t like the thought of someone handling her dessert so much. Eww. This entry is so helpful. I JUST received this machine for xmas and was feeling hesitation in keeping it. Now I’m excited to try it out. Got one of these for the holidays as well! Very excited to try it! Hi i got a baby cake pop maker for xmas. I love it i was lazy and used a box cake instead . Mine came out good. How ever i used there tip frosting using store brought frosting mix with chocolate chips and i got a drippy mess. I plan on getting some almond bark or candy coating to try again. Help!!! I got a cake pop machine for Christmas and I’ve started to experiment. I bought a red velvet box cake and whipped it up using the directions on the back. The bottom of my cake pops look great. But…the top is falling 🙁 What am I doing wrong? Thank you so much for this detailed review!!!! I bought this babycakes machine for my daughter as well as the mini cupcake machine. I love the helpful pictures!!! 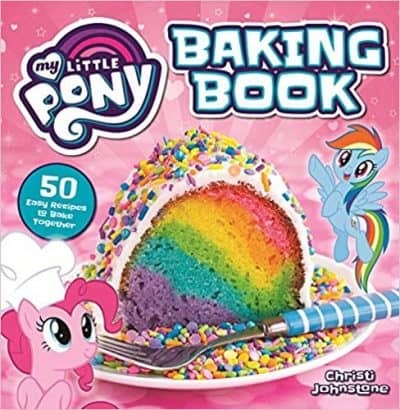 I am wondering if “cake mixes” can be used in leiu of the 12.00 box at Kohl’s?….. I love this machine! Regular cake pops are not really my thing, but these rock. I used pillsbury super moist white cake mix, wilton light chocolate candy melts for half of the pops, and dolci fruitta (sp?) white chocolate melts for the other half. Per some of the reviews on the baby cakes website I changed the box mix ingredients to one less egg and cut 1/4 of the water + sub milk. So the box originally said 1 cup water, 1/3 cup oil, and 3 eggs. I used 3/4 cup milk, 1/3 cup oil, and 2 eggs. They turned out great! So delicious. A tiny bit of shortening helped keep the candy melts thinned properly. The ziplock bag or a pastry bag for piping into the machine is a must. I just bought one tonight and had a blast! I used a boxed cake mix, but then I added a cherry and some mini choco chips to the batter before closing the lid to bake. Didn’t turn out perfectly round, but they were SO YUMMY! I made cake pops last night from total scratch and rolling them by hand… I had a hard time getting them not to crack… I am headed to go by this cute little gadget as soon as im off work. I am making them for my 2 year old nephews bday party which is mickey mouse themed. I am thinking about purchasing fondant to make the ears and such does anyone have any other suggestions? I have this machine.. and of course making the actual cake balls are the easiest part of the whole process. Then comes the dipping.. and thats where I lose all sanity. What kind of melting chocolate did you use? I got candy melts from Hobby Lobby and its so thick that my pops just slide down the stick or come off in the chocolate when im dipping them upside down.. help! Thanks for your review. I bought this a few weeks ago with the $10 kohls rebate and i have yet to try it out. I think the traditional cake pops are pretty gross, and a big mess to make, so I am looking forward to trying this little machine. I would love to make cheesecake pops in these, has anyone tried that? I read this article about the Babycakes Cake Pop maker and it inspired me. So I tried mine out for the first time today and it was an epic fail! They were not round at all. Just half circles and super small. Your’s are perfectly round. What am I doing wrong? I used a box cake mix. Could that have been the problem? 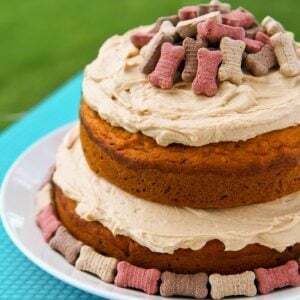 Stephanie, two things – yes, the box cake mix. I love love love the recipes that Babycakes has – delicious and very well suited for the machine. It’s a much thicker batter than you get with a mix. Second, not having enough batter in the wells will create a less than ideal shape. I’d try it again with their vanilla recipe – it’s my favorite. It’s almost more of a pound cake than regular cake. And I promise, really no more work than making a mix. I think a recipe created for the machine works better than a mix (which has a lot of variables based on brand, flavor…). Good luck! 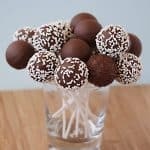 Your cake pops look so good, I love the idea of cake pops but the mixing in the frosting way is too sweet (for me) and looks like this will be a better option. When I read some reviews before, cons included pops starting to bake before every hole was filled. Is this because they pre heat? Do you have to preheat or you fill when cold and then bake it? Hi, i just bought one of these cake pop makers and was looking for some creative ideas for my 2yr daughter who was just diagnosed with an egg allergy. Do you have any recieps you can share? This is all new to me. 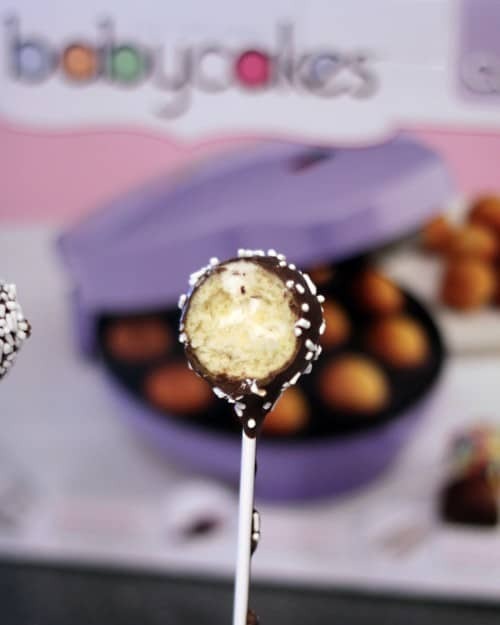 Really want one of these cake pop makers, but I live in the uk and cannot find them anywhere over here, or any company which ships internationally. Anyone know of any?? 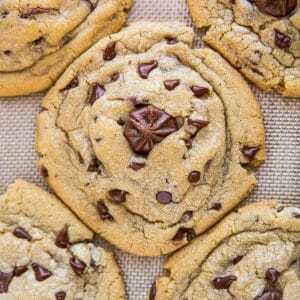 Can you give the full recipe for this vanilla recipe? Can you like post it? Or just like put the measurements on? Because I would really like to know the recipe!! Thanks! I have one of these machines, just got it for my birthday about a month ago, personally i found that their vanilla cake recipe was way too sweet for me. The difference between the two cake ball types (traditional and this) is that the traditional ones are more rich and heavy than these. These onesi found were very light and fluffy which didn’t bother me, it made me just want to pop more andmore into my mouth, but i think for some types of cakeballs the traditional way might be the better way to do it (not for all though). I didn’t try any fillings in mine yet. I’m planning to try it out as well. I kind of wanted to try out some new recipes for it too, like strawberry cake recipes or something of the sort. If anyone knows any good recipes for it i’d love to know about them! Your review was very helpful and enlightening, thanks for sharing it. I am making cake balls for a wedding. I was hoping to inject them however I find that the cake is dense and it does not take alot of filling to cause the ball to crack. So little filling that you cannot taste the filling! any suggestions? I was filling red velvet cake balls (babycakes recipe) with cream cheese frosting. Any suggestions? I made cake pops for the first time ever last night with my babycakes machine! LOVED it!!!!! Lovely all…EXCEPT— NEVER, NEVER would I use any kind of egg carton container…BACTERIA!!! Never. OMG i JUST got a cake pop maker YESTERDAY, I doubted it but your tutorial helped A LOT! THANK YOU!!! This cake pop maker looks very good. I’ll may buy one but first i will try to do this sweet without any machine. Would you be so kind and send me the batter’s and the buttercream’s recipe. I would be grateful for that. Rebeka, this batter won’t work without a machine for it, it would be a bit like trying to bake a cake without a cake pan. 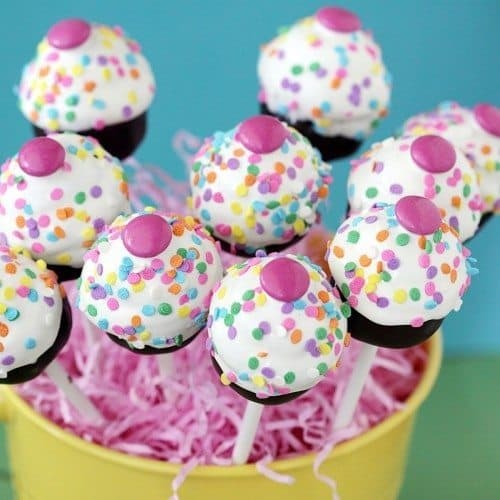 I would suggest a different type of cake pop, such as this one, if you want to make them without a machine. Awesome post!! So helpful. One possibly stupid question tho about the vanilla cake pops recipe. What does ‘1/2 cup ⁄2 butter softened’ mean? Like what’s the /2 mean?? Can’t wait to try it out! Hi Ruby, that was just some funny formatting in my recipe card program. I’ve corrected it for you. Enjoy! Have you ever tried to bake cookie dough in the cake pop maker? I’d be interested to know how it reacts to dough and if I make circular cookies. Thanks! Julie, I actually haven’t. I’d be curious to know what happens as well!